Never late than never with a label like Kenzo, Selfridges Oxford Street, London is partnering with them to take up residency in Men’s Contemporary for one month only from today – 21st November. Join them in Men’s Contemporary on 1 for The Kenzo Juice Bar and exclusive DJ sets, plus try out the Kenzo Kameleon Camera. Selfridges also have the AW13 men’s collection available for you to shop as well as the pieces made exclusively for Selfridges that you won’t find anywhere else. To celebrate, Kenzo will be hosting three exclusive events in store on Thursday 21 November, 5 and 12 December between 6pm and 9pm, as well as launching a dedicated space on the website soon. My choices? These above, the Tiger Print Bomber and the Weather Stripe Jumper. 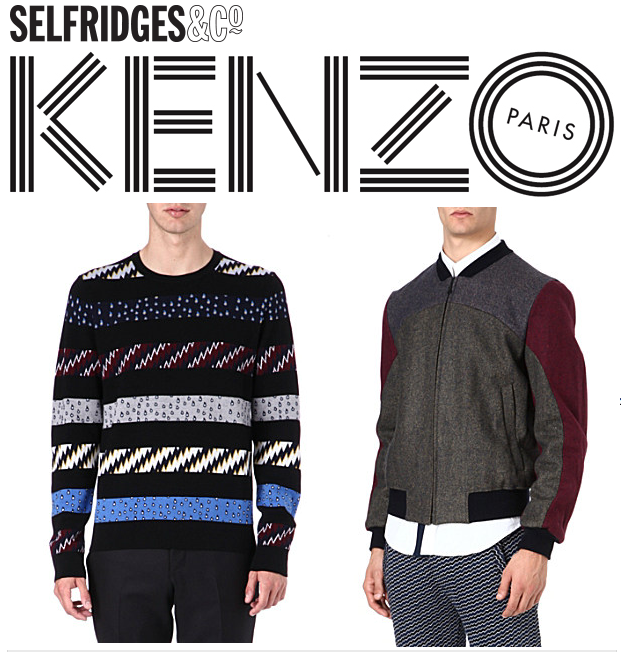 I am a huge kenzo fan! Will definitely pay a visit soon!